I've recently been reading a bit about Japanese "shiro" nibs which, as I understand it, were made from a steel alloy at a time when gold could not be used. I'm interested in whether anyone on the FPN has used one of these nibs and if so, how the quality and characteristics of the alloy compare to a gold nib. It particularly interests me because steel nibs generally seem to be more "nail like" than the gold equivalent, going on what I've read, but I understand that some of the shiro nibs actually have a lot of flex. It may not be possible to generalise too much, but I'd love to know the experience of anyone who's used one. Edited by callida, 24 May 2008 - 01:06. I have quite a bit of experience with these shiro pens. I sell a lot of them, but I also use them in my daily writing. These Shiro pens tend to be much more springy than gold flex nibs. You may need to press a little harder with a shiro nib than with a gold nib, but it will spring back into shape. What I love about these Japanese shiro pens is that they tend to have a much finer point than the usual American gold flex nib, and for calligraphy work I want a razor sharp fine point that can flex to an extra broad and still be smooth. The first shiro alloys coroded quickly, but non-corrosive alloys were soon manufactured. When you are buying one, ask the seller if there are any rust or corrosion spots on the nib. If so I would avoid it. The rust will spread quickly when you start using the nib with ink. Also the Japanese pens typically have good iridium tips, so if used properly they last forever. These pens also tend to be cheaper than gold flex pens. I have a few on ebay but I have far more stored away in boxes. If you are looking for a deal write me back channel. 'Shiro' in Japanese, means white, and is used to describe the 'white metal' color of the stainless steel nibs. There was no secret metallurgic miracle in Japan that produced 'shiro' nibs. They were ordinary stainless worked into sheets usable for nibs. They come in very flexible to ultra-stiff. Some time ago I had several boxes of pre-war pens with 'shiro' nibs. All of the pens were of the same design and came in assorted celluloids and black. All of the nibs were the same in appearance, size, and markings. Trying out each pen, the flexiness to stiffness ratio formed a bell curve with a few real flexible and a few stiff. Most makers did not make their own nibs and relied on other specialty firms for this task. They could not ask for all flexible or all stiff and got what they got. It was hit and miss. Besides, very flexible nibs make it difficult to write intricate Japanese characters and, when these nibs are found today, it may be that they were not used much or didn't sell. Smoothness, or the ability to flow freely accross a normal piece of paper, formed a sililar bell curve with no relationship between flexiness and smoothness. Smoothness is almost solely related to tip and how it was ground. Because flexible nibs had more give, they did seem to be less scratchy when inked. Compared to gold, some are as flexible and smooth. Until the 1970s, they were the exception. In the 1970s Pilot developed the techniques and found the better steel needed for steel nibs that were the equal or superior writing ability of gold. Sailor, too, marketed pens with TIGP (Titanium Gold Plated) nibs that were as good as gold. Unfortunately, the market demanded gold and they did not sell as well as hoped. Despite the reputation of stainless as being rust-proof, they are not and one will see some with minor rust stains. Some are even stamped RUSTPROOF but, one can see they have not withstood the test of time. This is due to the high acidity of some inks. As with all nibs, one must try them out or take the word of the seller. If purchasing one from eBay or online ask if it is returnable if it is not as smooth as the seller claims. My personal preference is to go for the gold and only try to buy pens with stainless nibs if they appear flexible or come with a pretty piece of celluloid attached. Sometimes, I'll go for a larger model if the condition is superior. I stay away from eyedroppers as fixing them is not worth the hassle. Unless, of course, the pen is truly collectable. Check out a few. Don't bid too high and don't get suckered in by the sales pitch. 'Shiro' nibs are not that special. Edited by stan, 24 May 2008 - 02:29. I have several... they are all quite flexible, certainly more exciting than gold, IMO. 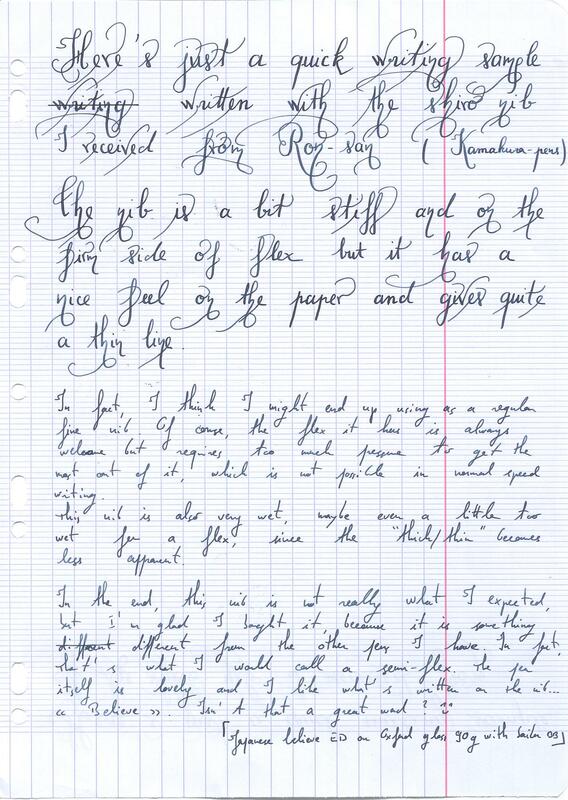 Flexible nibs are not a big interest of mine, because the style and size of my handwriting is unsuitable. However, when I do want to do something decorative and special I go to my steel Japanese nibs over my gold nibs - because the points are very fine and give maximum variation to the line. How wonderful to find three such rapid and well informed responses. Thank you very much for taking the time to respond to my question with such useful information. I hope others may find it useful and interesting too. It is a Japanese ED with the safety plunger. I took a while to understand how it worked since I didn't find where the nib was unscrewing Anyway here it is! Edited by Shinichiro, 26 June 2008 - 15:10. Is the Falcon nib one of the more flexible Japanese nibs made of gold? What others might there be that exhibit similar flex? Thanks a lot for the writing sample and comments, Shinichiro - that's very helpful. Looks like a gorgeous pen, too.